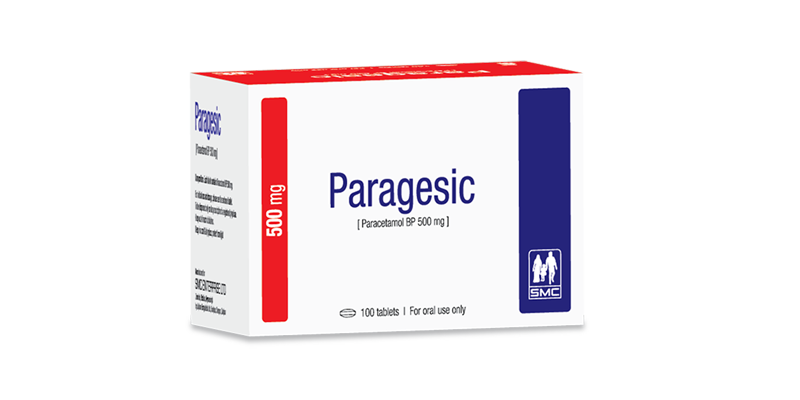 Paragesic tablet: Each tablet contains Paracetamol BP 500 mg.
Paragesic is the formulation of Paracetamol which is one of the safest and most widely used analgesic and antipyretic. Paragesic produces analgesic action by elevation of pain threshold and antipyresis through action on the hypothalamic heat regulating center. Paragesic exerts significantly milder side effects and most unlikely to produce many of the side effects associated with Aspirin and NSAIDs. Paracetamol is safe in all stages of pregnancy and lactation. Paragesic tablet: Box containing 10 x 10’s tablet in blister pack.